Ursus is driven by innovation. Quick release production was a new technology in 1967 and the two founders split the tasks, Sergio being responsible for the Business development of the company and Domenico was responsible for the actual manufacturing of products. Their relationship is very close and based on professionalism and trust, the same values shared by all Ursus employees. Ursus created an internal synergy from the beginning thanks to the presence of various techniques of metal working and precision machinery, quickly distinguishing itself on the national scene. The first big step came in 1966 when they patented the quick release and extended its use to the folding bikes. Through its ongoing developments and patents Ursus established itself in the bicycle industry, continuing to launch and manufacture products such as hubs, brakes and kickstands. In 1974 a boom in the sales of bicycles resulted from an increase in oil prices: the demand grew and Ursus announced that with the increased productivity they would build a new production facility in 1978. During the 80’s, with its bright colors and eclectic fashion, came the birth of the MTB. Ursus responded to the new trend by patenting and creating a brake for off road bikes. With the new production facility Ursus decided to expand to other productive sectors. Their new building was equipped with an updated fleet of machineries which would allow them to successfully access other industrial fields. 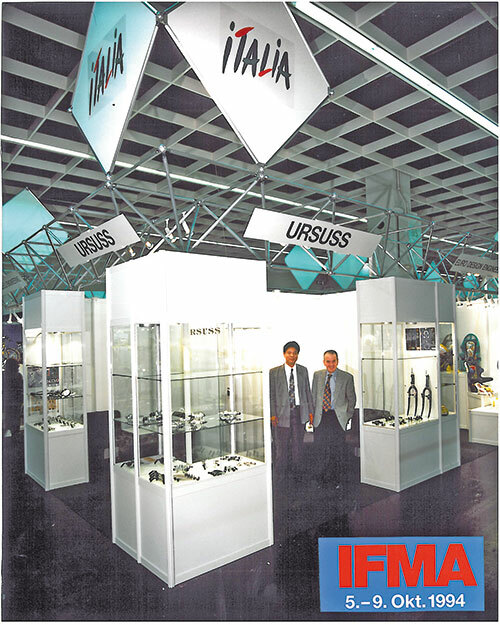 In the early 90’s Ursus was already exporting to Europe high levels of mechanical components for leading automotive, household appliances and plumbing businesses. Ursus’s competence in metals is the result of the first generation of professionals who chose to work directly with raw materials, thus having a better knowledge of how they can best be used, just like a chef has the proper knowledge when selecting and combining his ingredients to create a master dish. The ability to know the material with which you work is the legacy which has been handed down to the new generation of URSUS employees. In 1998 Ursus S.p.A. became a joint-stock company owned by shareholders which, with the dawning of the new millennium, gave birth to the most recent and ambitious Ursus project: THE WHEEL. Since 2004 Ursus has worked with professional cycling teams while being involved and represented in many areas, supporting and promoting activities and competitions focused especially on the youth. Strength, sacrifice and perseverance are the key values Ursus believes in, and its history is proof of successes achieved through hard work, dedication and motivation. Like the Gladiator who sees in victory the meaning of life itself.